It's been a few days since my last post. Work and private issues have come in the way of either blogging as well as painting. Actually I still don't really feel like wielding a brush, but at least I've managed to get a few figures done I had standing around half finished for a while. As for blogging it actually felt good taking a break away from it for several weeks. It can be such a drain on already sparse free time that I felt I'd need to readjust my priorities. But enough of that now. On to the miniatures! First of all apologies for not having commented on some of your blogs as of late. Blogger seems to have a glitch as there are a few blogs I simply can't comment on, no matter what I try. WhenI try to send my comment it simply vanishes. Not sure if it's maybe goofiness on my part, so I'll keep tryin'. 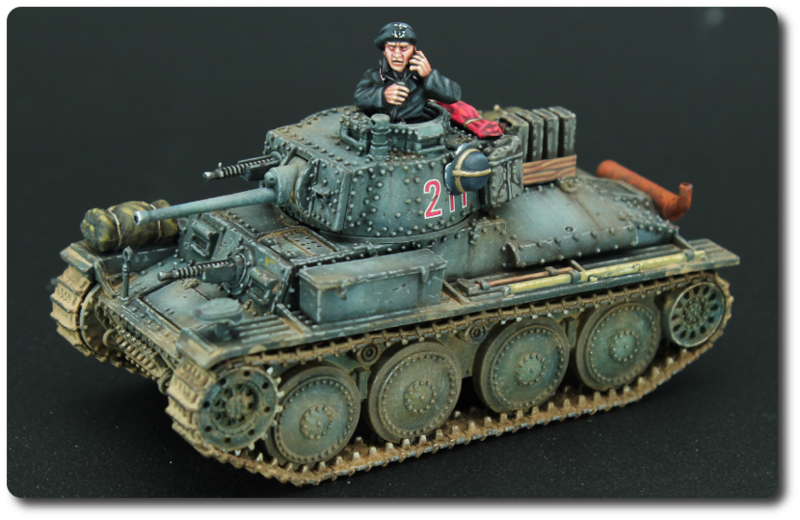 I was eyeing the plastic Panzer 38(t) from Warlord Games for a good while now, but as I currently wasn't into Early War WW2 I saw no imminent need and thus was in no hurry to get me one. 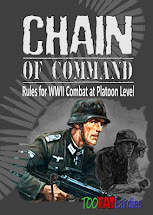 Well, this immediately changed with the release of the Blitzkrieg 1940 supplement for Chain of Command by TooFatLardies. 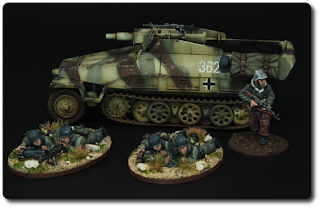 It's not only crammed full to the brim with army lists for the six nations involved in Fall Gelb and Fall Rot along with rules amandments for even more period flavour, but also contains five new scenarios to give you even more Blitzkrieg for your bug. Well, you see... I'm quite impressed with that latest offering from the Lardies. Well, let's talk Italian for a change. 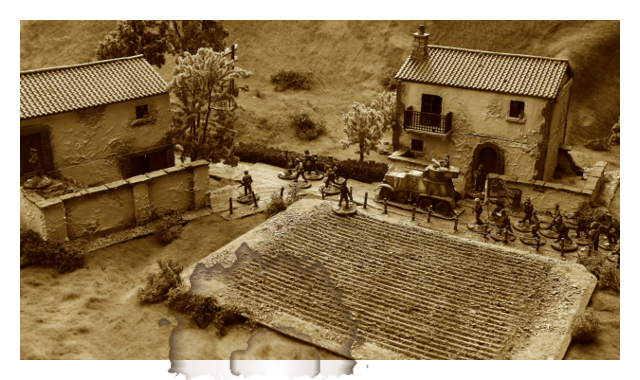 Over the last months I've been painting away on a small Italian unit for fellow Blogger Pat, well known through his blog -Wargaming with Silver Whistle- and Author of the rather excellent "Setting the Scene: Winter Wargaming". Right now he's working on a second book focusing on the Mediterranean. I've painted a few figures previously for him which featured in his first book and as he asked me if I'd like to paint something for his upcoming book I took the chance to help the Regio Esercito Italiano to "their place in the sun". Due to the ongoing heat wave in this part of Europe I've barely touched a brush over the last few weeks. It was only in the early hours when temperatures outside were down to a bearable 24°C (which didn't mean the flat has cooled down as much sadly), that I got in any painting time. 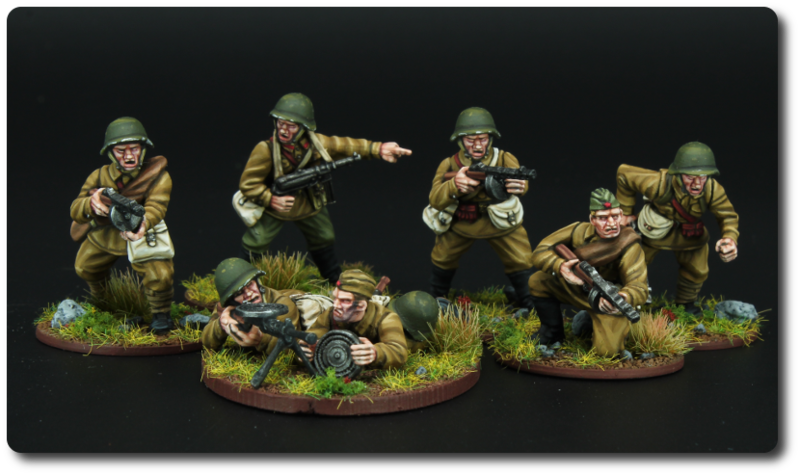 Instead of finishing off the afore mentioned Italians I made best use of what little time I had before the heat struck again, and finished off a second squad of Soviet Tank Riders for Chain of Command. 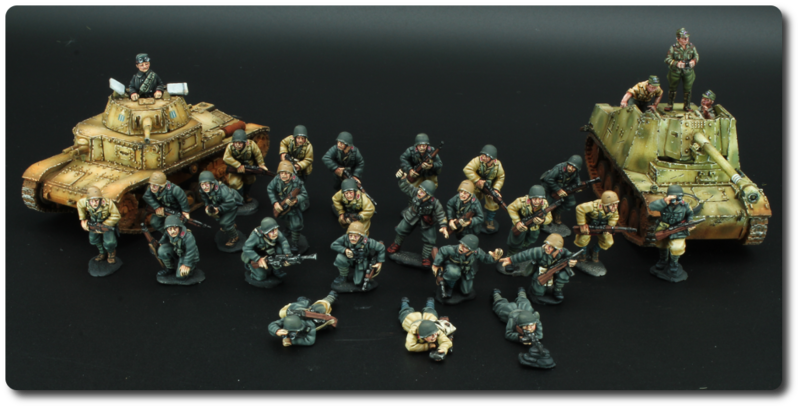 Well, to be perfectly honest I actually should be sitting on my desk and paint some WW2 Italians I promised to get done for a friend. And actually most of them are more or less done already... just the finishing touches. Ok, who am I kidding here? Just a few snapshots of a recent game of Chain of Command we had at my place. It saw an American advance column facing off against German Fallschirmjäger somewhere in Holland late summer 1944. Both forces were regular and had minimal support, i.e. no tanks or other flights of fancy. 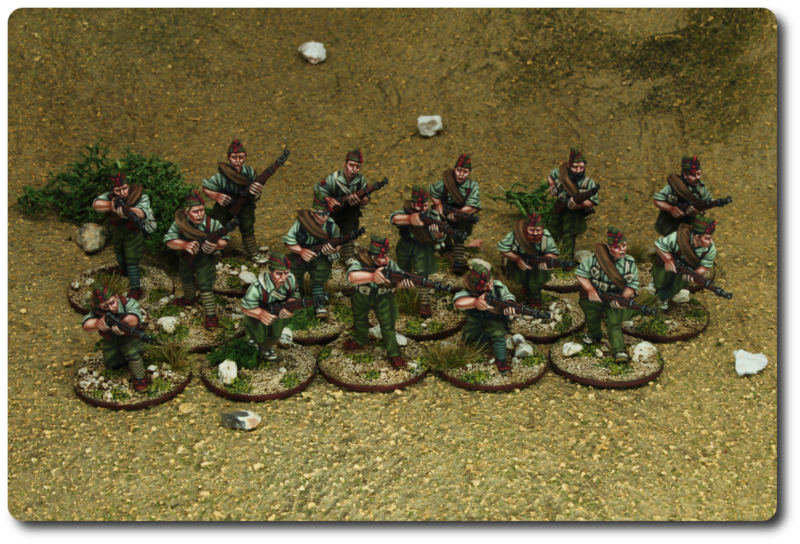 The Germans started off with a Force Morale rating of 10, where as the Americans had to make do with a mere 8. I haven't painted anything for my Late Romans in a while and, truth be told, even todays offerings were finished quite some time back in 2017. But I've finally got in gear and took some photos. First off my new mounted Warlord/ Tribune. 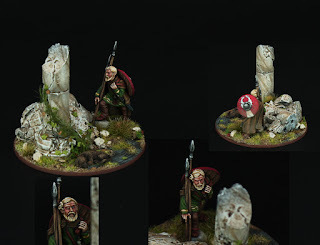 Figures are Westwind Miniatures with heads taken from Wargames Foundry. Westwind do some very characterful figures, which fit nicely with Footsore and Gripping Beast, but some of the heads can be a little hit and miss unfortunately. I've been running a small competition on the German Sweetwater Forum. The goal was to create a small vignette. To see the other entries I encourage you to visit the link above. Some really nice scenes there. I hardly have touched a brush since the end of the challenge, thus I finally took the opportunity to take some pictures of miniatures I already painted last year but didn't come round to post. First will be my small collection of Gladiators. 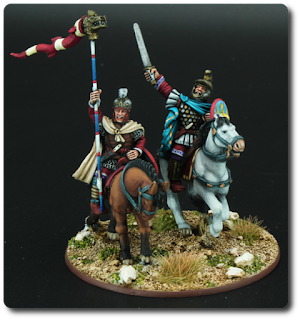 Miniatures are from the superb Crusader Miniatures range and were a real joy to paint. I even took the chance to try to hand paint the shields. I'm rather chuffed I have to admit. In my opinion Gladiators also offer the perfect chance to try out some recipes for different skin colours. I still have some more of these in the painting queue but these will have to wait till I feel a little more like painting again. ... oh well, bugger that. 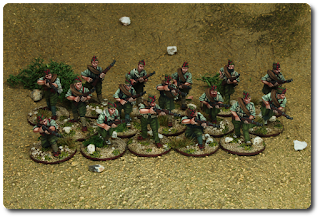 No, in fact I started work on some US Army guys ready to invade Tunisia/ Sicily/ Normandy. Figures are the current Battlefront plastic offerings. I got them for a steal which meant instead of painting up some Brits for a change, I was stuck with US... again. The figures are OK-ish. Better than most of their metal ones but still there's the odd miscast in the mix. Having had a few days off this last week I decided I'd would probably make best use of it by painting up some of the armour, that was sitting unfinished on my shelf for months now. While I generally like painting armour I need to be in the right mood for it, as firstly I actually quite hate airbrushing and secondly I'm always worrying about overdoing the weathering. Who would have guessed? Three consecutive entries in just as many weeks. Seems like while the challenge slowly but surely is drawing to a close my hobby boat is finally taking up some much needed steam. This week sees me back at a project I keep returning to time and again, but never quite seem to have the stomach to see it through. Just a token submission today as life has once again got rather busy around here. I won't bore you with the details as I know you all will be familiar with such moments in your hobby lives. After having just recently made the switch from Bolt Action to Chain of Command -and not having regretted it for a second- I felt the need for adding a few items to my Fallschirmjäger force. 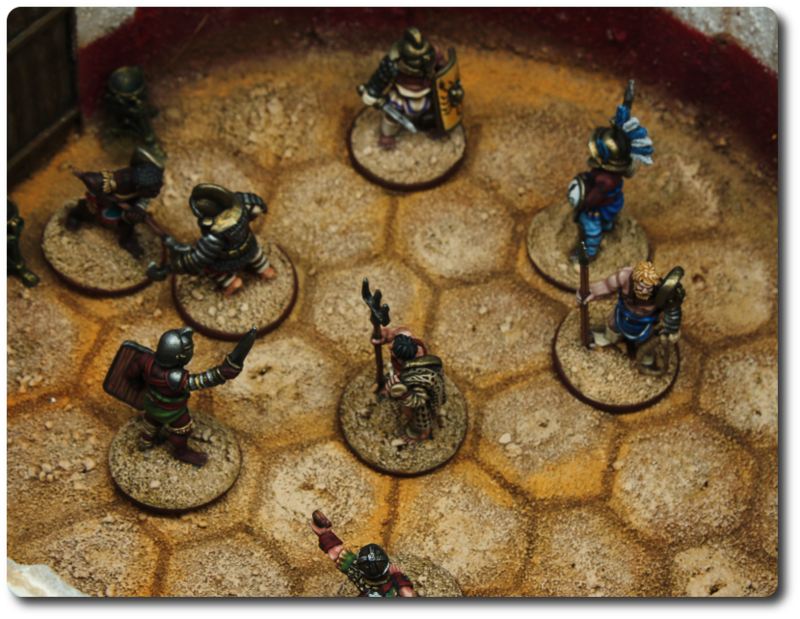 It's almost been a month since my last entry, which is a shame as I had the miniatures for this submission sitting almost finished on my desk, for the best part of two weeks. Real life got in the way and thus I only came round to take pictures this week. We have a saying here in Germany: "Mit Kanonen auf Spatzen schiessen", literally translated as "To shoot with cannons at sparrows", meaning something along the lines of cracking a nut with a sledgehammer. And that in my opinion sums up the 8.8cm FlaK, when used in an anti-tank role in a Spanish Civil War setting, nicely. Shooting high velocity armour-piercing rounds at targets with paper thin armour could be considered something of an overkill by some, but that's just what happened. This entry definitely was a close run thing. Just as I type this I'm waiting for a colleague of mine to pick me up for work. I still have to pack my stuff for the week, so I better make this short. 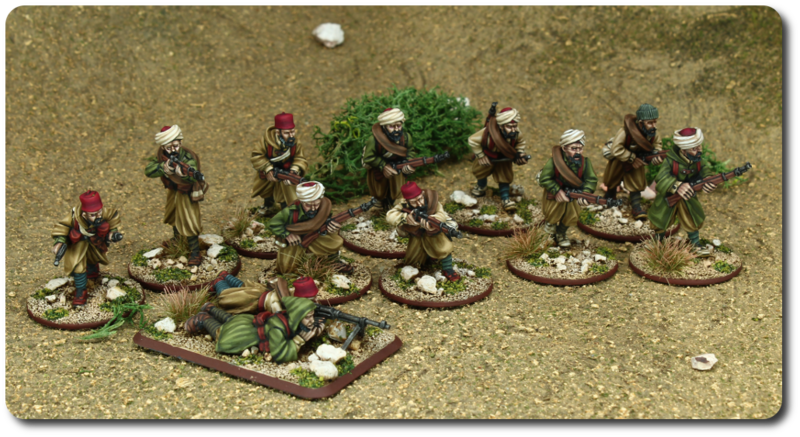 Well, todays entry sees the first few Moroccan Regulars for my ongoing Spanish Civil War project. My first post in the new year and I'm back to a project from last years Analogue Hobbies Painting Challenge. Back then I started what was to become my main project for the whole of 2017, i.e. 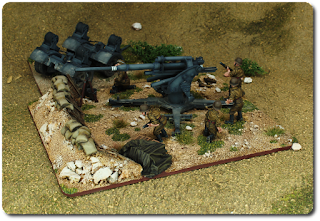 a force for gaming the Spanish Civil War. 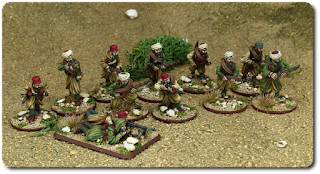 I settled on starting with the rather fetching Spanish foreign legion but it inevitably became two forces as I simply couldn't pass by all those lovely Republicans on offer from Empress Miniatures. 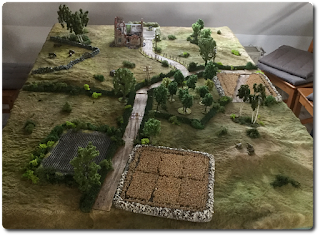 Still, I'm back to reinforce la Legión in order to finally get in some games using Chain of Command from the TooFatLardies. 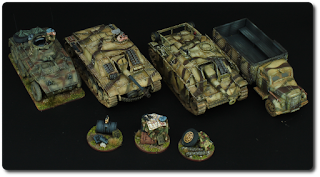 Wargamer und Hobbymaler. Vor allem historisches, aber auch ein paar Pulp und SciFi Miniaturen lassen sich auf meinem Maltisch finden. Warum gibt`s hier nichts Aktuelles? 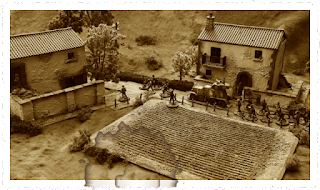 Ad Machina Wargaming » Pistoliers ready for combat!